I’m not sure how long this tool has been around but I just learned about it today and I’m in love already. 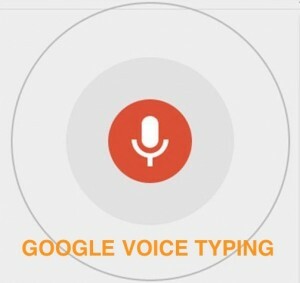 Google Voice Typing allows you to open a Google Doc and speak into a microphone and let Google do the typing for you. As a matter of fact I’m writing this blog post in a Google Doc first using the voice typing command. 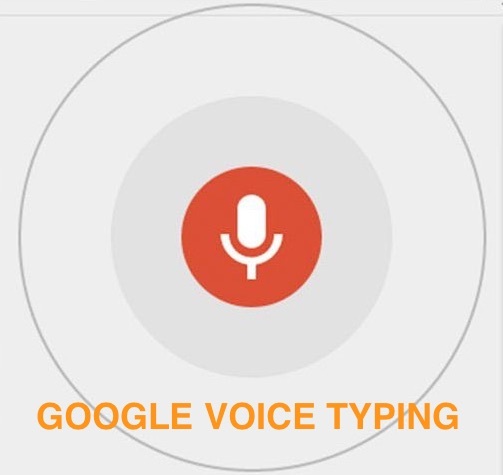 All you need to do is open a Google Doc, go into Tools and choose Voice Typing. This will then bring up an icon of a microphone on the side of the doc. Whenever you’re ready to start typing just click on the icon and begin speaking into the microphone. As of now, I believe this tool is only available in the Docs part of Google Drive. Here is an example of what some of the blog post looked like before I did some corrections. This was taken at the beginning of writing the post, and as you can see I did make some changes. But overall, it worked beautifully. For anyone with a learning disability, such as dyslexia, it allows them to type without having to make as many spelling mistakes that can often accompany this type of disability. For those with carpal tunnel, it can also help alleviate some of the symptoms as you will be typing less. It works when outlining, planning, and writing papers. Use it when writing email where you could write the email in Google Docs and copy it into your regular email. This is particularly helpful for long emails or emails where you need to go into a detailed explanation. I think it’s fabulous for brainstorming as you can just speak your ideas and not feel the need to type every single thing that you’re thinking. Lastly, I’m curious to see how well it would do taking notes, in a meeting for instance. Can you think of any other uses? If so, share in the comments! I do recommend that if you want to use this tool you try a microphone that can maintain an equal distance from your mouth, such as the one that maybe came with your cell phone or a headset mic (that can be checked out from TLT). The better the microphone quality, the more accurate the typing. When speaking, it does recognize punctuation as well as the “new line” command. However, it didn’t seem to understand a few other words such as “delete” or “backspace”, so it will require that you go back through your document when you’re finished. and do some formatting. However, it’s a great way to type a lot of text quickly and easily without a lot of headaches.